Celebrating Thanksgiving in London this year? 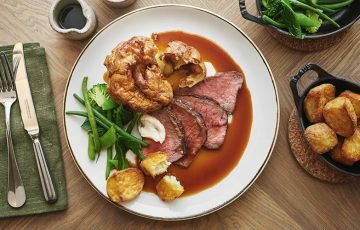 Whether you’re dreaming of traditional roast turkey or indulgent pumpkin pie, here’s where to dine out and give thanks in the capital. 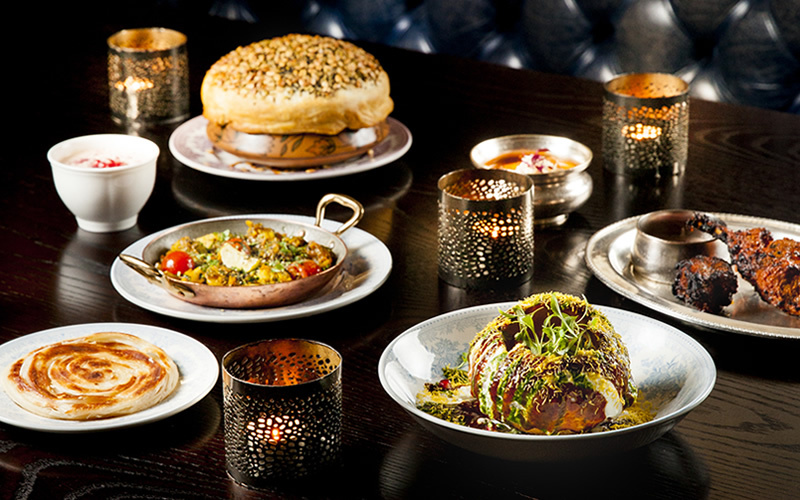 Round up your loved ones for a Thanksgiving feast served sharing style at Village East in Bermondsey. Priced at £40pp, the main event is roast turkey with cornbread and sausage stuffing and a rich Calvados gravy. They haven’t skimped on the sides either – expect maple-buttered sweet potatoes, glazed sprouts, and mac ‘n’ cheese. The menu includes a cinnamon Old Fashioned and your choice of pecan pie or pumpkin brûlée pie for dessert. Book a table at this Park Lane restaurant to enjoy a special Thanksgiving afternoon tea, complete with fried turkey and buttermilk bisquets, maple-bacon macarons, and candied pecan cake pops. They’re also serving a Thanksgiving dinner menu that embraces the hearty, comforting flavours of autumn. Choose from dishes like black truffle risotto, roast turkey, sea bass with root vegetables, and apple and blackberry crumble. Afternoon tea is priced at £55pp, while dinner is £110pp. 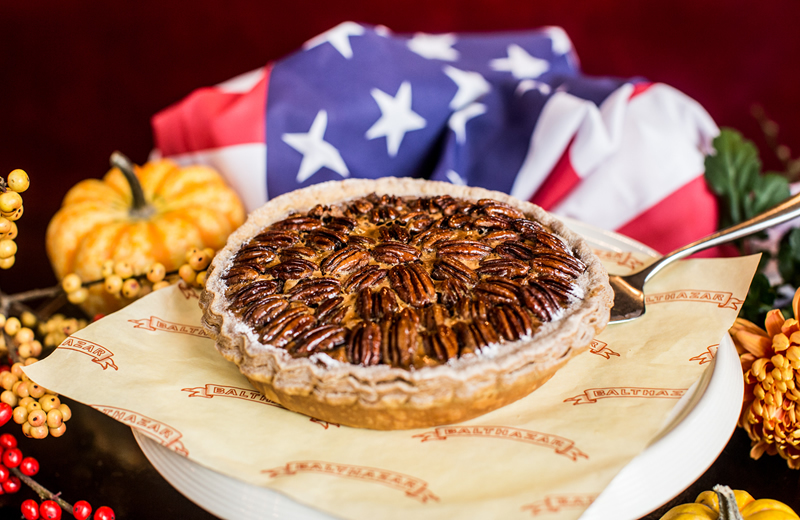 Each November, Balthazar celebrates its American heritage with a special set menu in the restaurant and the most delicious pumpkin and pecan pies in the boulangerie. This year’s 3-course menu is priced at £55pp and includes spiced squash soup, roast turkey, baked cod with a Parmesan-thyme crust, and pumpkin cheesecake. 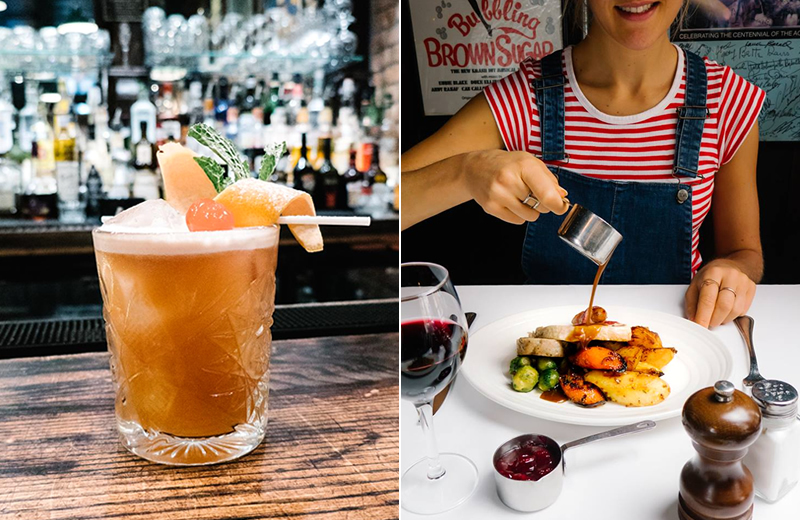 They’re created a seasonal bourbon cocktail for the occasion, too – a Gingerbread Fizz spiked with with Maker’s Mark, gingerbread liqueur, and vanilla vodka. 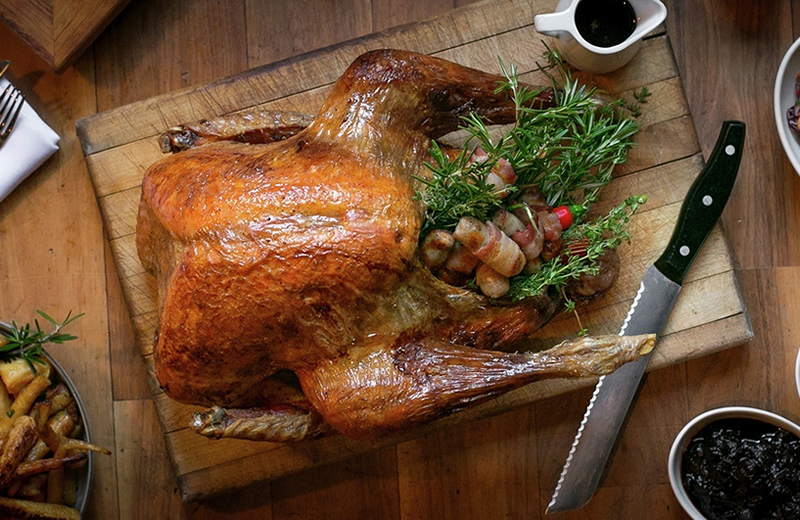 This buzzy Shoreditch restaurant goes all out for Thanksgiving, and this year is no exception. 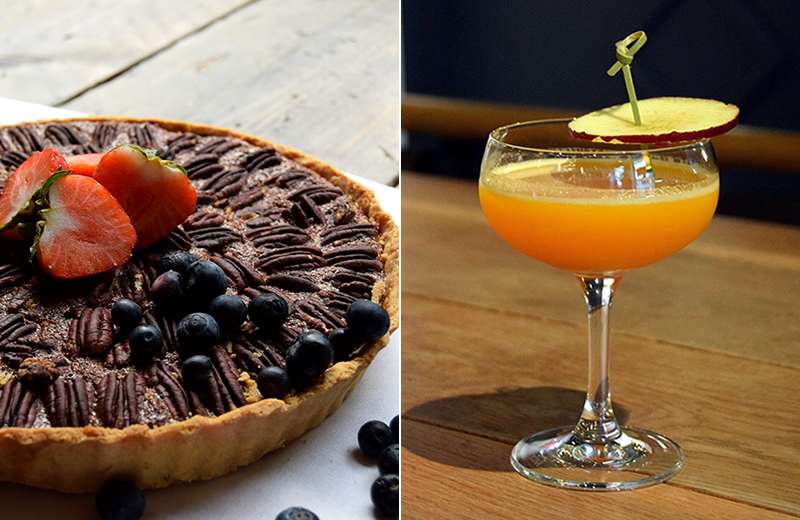 Their 3-course menu is priced at £35pp or £70 with paired drinks inspired by classic US anthems and harvest fruits. Kick things off with a Bad Apples rye whiskey cocktail and then tuck into squash soup with winter truffle, roast turkey with all the trimmings, and your choice of pumpkin or pecan pie. Whether you’re celebrating with family, friends or work mates, the all-American menu is sure to hit the spot. It’s also available at their sister restaurant, The Jones Family Kitchen, in Belgravia. With its warm lighting, pink banquettes, and stunning seafood bar, Neptune provides a stylish backdrop for any occasion. They’re celebrating with a 3-course menu priced at £35pp which will be shared across the table in true Thanksgiving style. After a New England-inspired clam and smoked bacon chowder, there will be slow-roast Norfolk Bronze turkey with stuffing, cranberry sauce, and three indulgent sides. It sounds like quite the feast but we’re sure you’ll find room for some of their pumpkin custard tart. Joe Allen has been a Covent Garden institution for over four decades and remains a firm favourite with expats and locals alike. 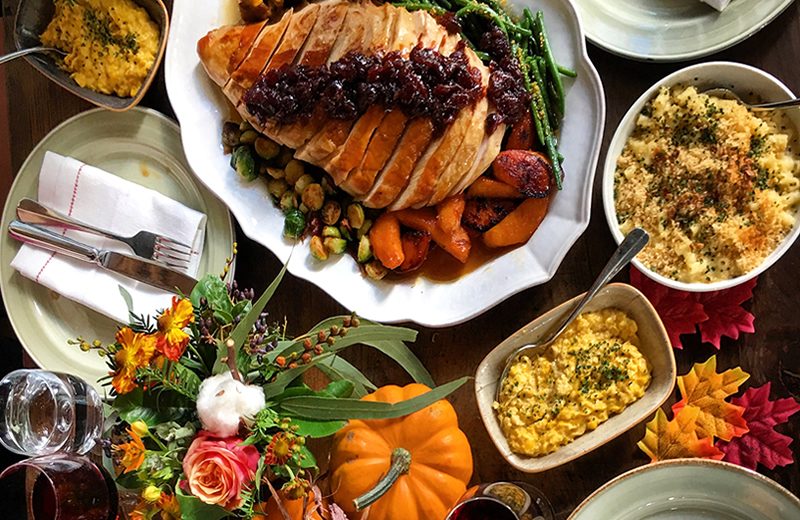 This Thanksgiving, the restaurant will be shaking up bourbon cocktails and serving a traditional feast accompanied by a live pianist playing tunes from the great American songbook. The menu, priced at £40pp, includes American comfort food classics like truffle mac ‘n’ cheese croquettes; sweet potato, sweetcorn and smoked bacon chowder; and spiced pumpkin pie for dessert. The roast turkey (or roast ham if you prefer) will be served with sweet potato mash, buttered Savoy cabbage, carrots, parsnips, roast potatoes & cranberry sauce. Where better to celebrate Thanksgiving than in the elegant Art Deco surroundings of The Savoy Grill? After a cocktail or two in the American Bar, take your seat in the dining room for a 4-course feast priced at £68pp. After pumpkin soup and oysters Rockefeller, diners will enjoy traditional roast turkey with sweet potato gratin, glazed parsnips, red cabbage, and turkey jus. Be sure to save room for the peanut butter parfait with cranberry ripple. Still searching for the perfect place to celebrate Thanksgiving in London on 22nd November? 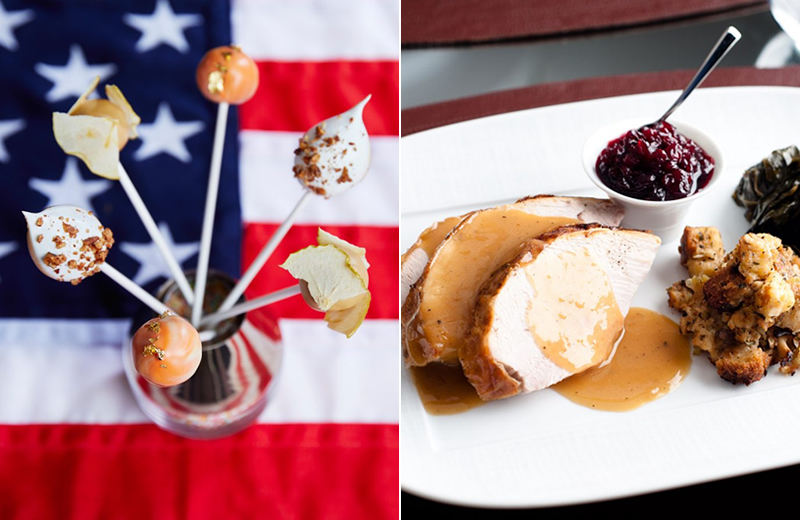 Check out the Thanksgiving menus at Christopher’s, South Place Chop House, Big Easy, Maze Grill, and 34 Mayfair. If you thought pumpkins were just for Halloween, think again! They’re cheap, versatile, and packed full of nutrients to fend off those winter bugs. You can roast them, blend them into soups, or – better yet – leave it to the experts and try one of these seasonal pumpkin dishes. This dish is almost too pretty to eat, but don’t let that stop you. 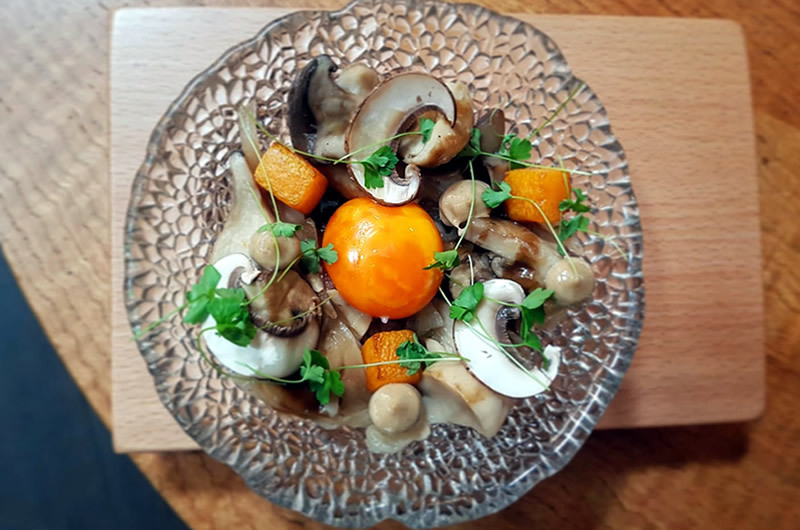 Grab a fork and tuck into ‘Hongos en Escabeche’ – roast pumpkin, lightly pickled mushrooms and egg yolk. 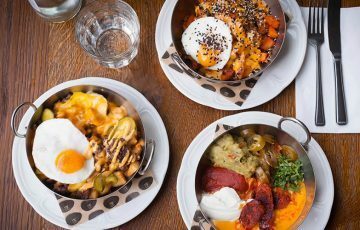 Try it for yourself at ENEKO Basque Kitchen & Bar, a West End restaurant with a menu overseen by acclaimed chef Eneko Atxa. Bringing Italian elegance to the heart of Covent Garden, Margot is perfect for date night or a pre-theatre supper. 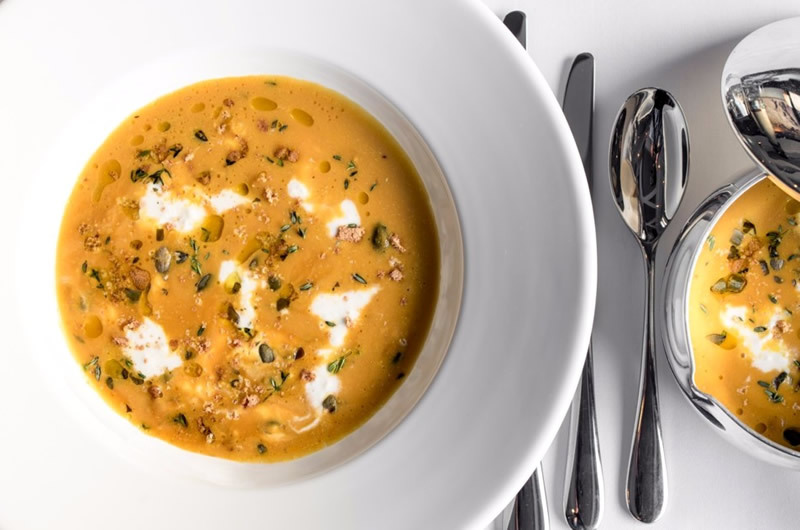 This autumn, they’re serving a velvety smooth pumpkin soup with burrata Pugliese, amaretti crumble, and toasted pumpkin seeds. If you’re more into pasta, their pumpkin and ricotta ravioli comes highly recommended. There are few dishes more comforting than risotto – especially in the winter months. 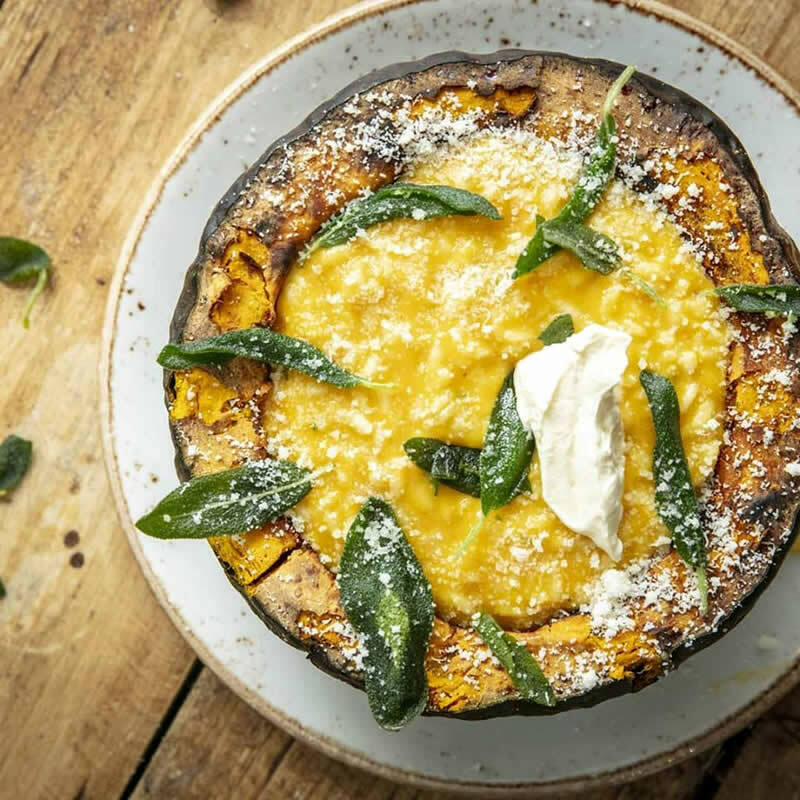 If you don’t fancy slaving over a hot stove, book a table at Francesco Mazzei’s Islington Italian, Radici, to try this rich pumpkin and sage risotto. Bermondsey pasta bar Flour & Grape is celebrating autumn flavours with this tasty new small plate. 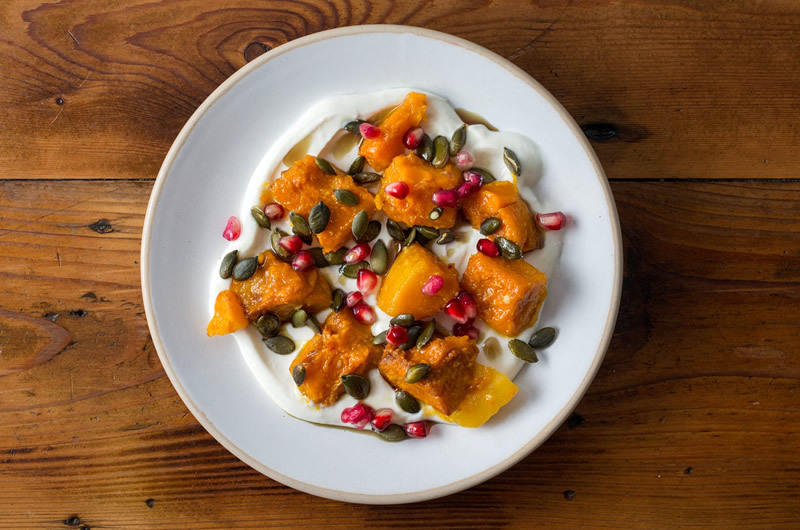 They recommend a glass of chilled Timorasso (a full-bodied white) with this roast pumpkin, pomegranate, ricotta, and pumpkin seed salad. After a few shared plates, you can tuck into winter warmer pasta dishes like rigatoni alla Norma or pappardelle with beef short rib ragu. A favourite with Notting Hill locals since 2001, E&O’s beautifully presented pan-Asian dishes continue to impress. Why not take some friends along for a dim sum feast? 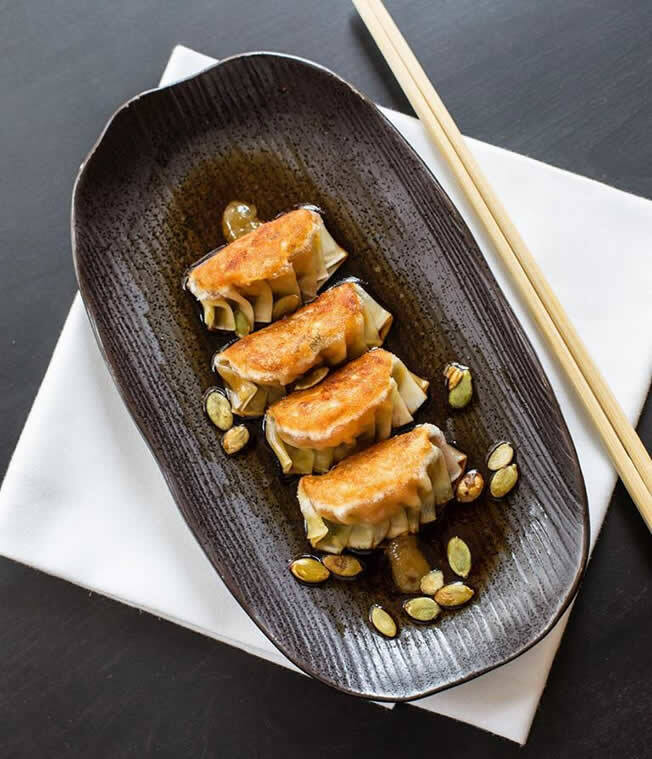 Don’t miss their famous pumpkin gyoza – they’re so good you might want to order two portions. We’re also big fans of their fragrant green curry with aubergine, lychee and roast pumpkin. 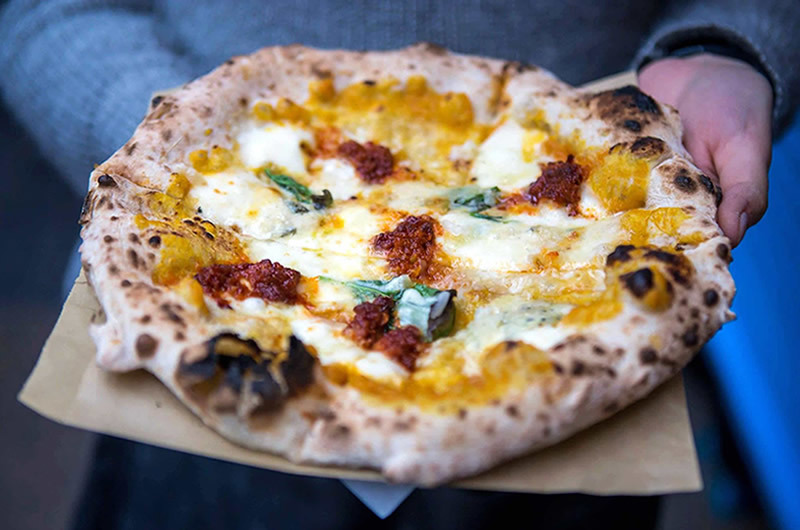 If you work near Spitalfields, you’ve probably already heard about Sud Italia and their superb Neapolitan style pizzas. They let their dough rise for 24-36 hours so it’s light and easy to digest – no carb comas here. Try the classic marinara or something different like their Zucca pizza topped with pumpkin, fior di latte mozzarella, gorgonzola, Parmesan, Pecorino Sardo, and fresh basil. Celebrate the Hindu festival of light with special dishes, events and tasting menus at some of London’s top Indian restaurants. From 30th October, JKS Restaurants will start a month-long celebration to mark the group’s 10-year anniversary and 5 years of Gymkhana. 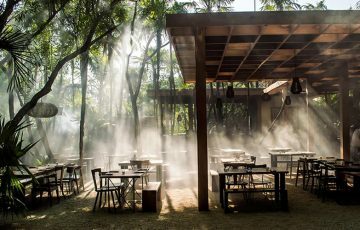 The restaurant’s exterior will be decorated with exotic flower curtains and sparkling lights, while their chefs will be serving a six-course Diwali tasting menu. Dishes include seafood pepper fry, tandoori masala lamb chop and boti kebab, and guinea fowl biryani with pomegranate and mint raita. The Diwali tasting menu will be available from 5-9th November, leading up to an candlelit feast on Saturday 10th November. It’s priced at £85 or £80 for the vegetarian option. On 4th November, Jamavar is hosting a ‘Suits & Sarees’ dinner, featuring a decadent six-course Diwali feast. Drawing on the custom of wearing new and beautiful clothes for Diwali, guests will be encouraged to dress to impress. The restaurant itself will be adorned with candles and lights to signify the triumph over evil and darkness which is at the heart of the Diwali festivities. 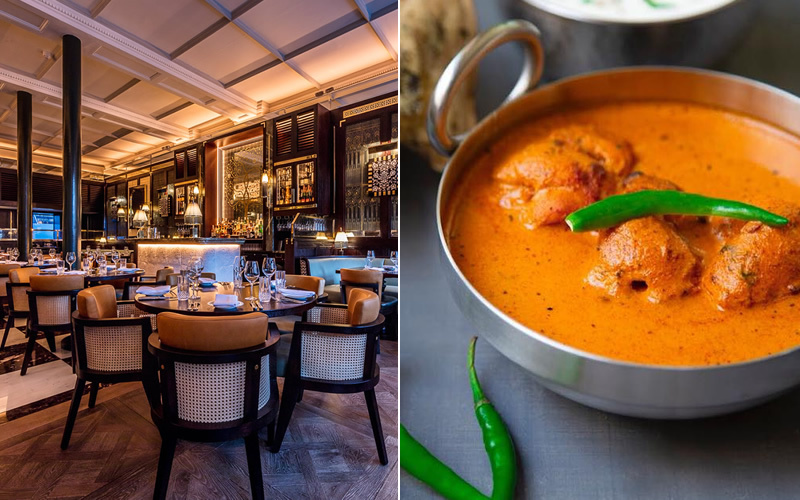 The lavish tasting menu will include Tellicherry pepper and garlic soft shell crab, Adraki spiced lamb chops, and the restaurant’s famous murgh makhani (butter chicken). Diners with a sweet tooth can look forward to a trio of desserts: gulab jamun, coconut and white chocolate kulfi, and khubani ka meetha (a sweet made with dried apricots). 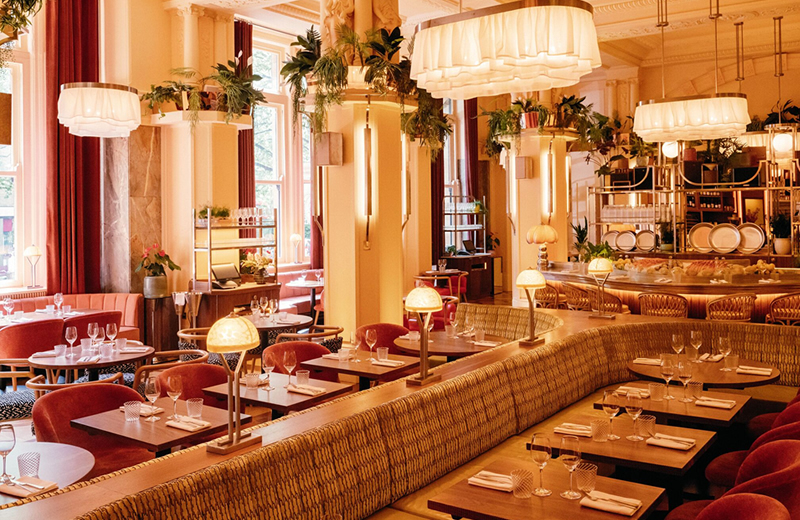 Why not celebrate in style at Vivek Singh’s multi-award-winning restaurant in St. James’s? 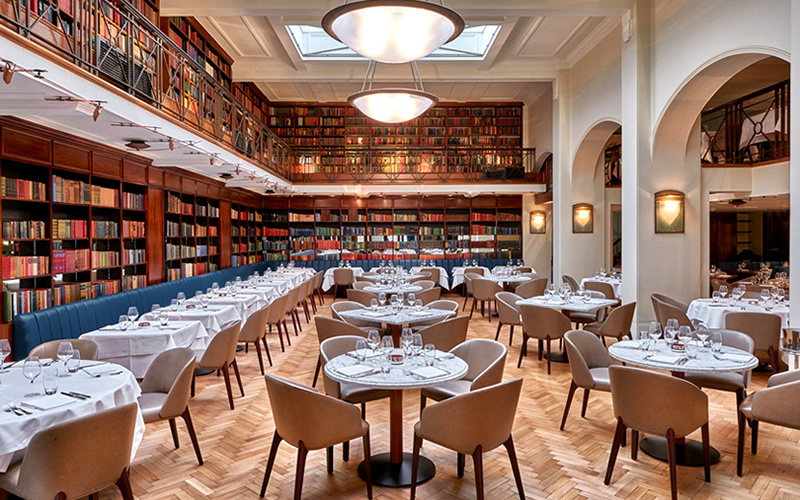 Set in the former Old Westminster Library, the elegant dining room is the perfect backdrop for Vivek’s contemporary Indian cuisine. 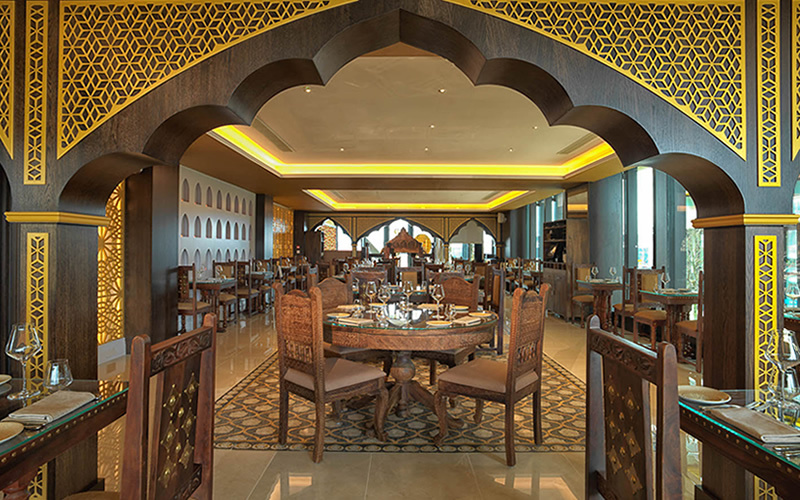 For Diwali, the restaurant is serving a four-course set menu which includes Bengali-style crab cutlets with lime pickle mayonnaise, tandoori salmon with green pea relish, and rack of Romney Marsh lamb with a nutmeg and peppercorn sauce. The Diwali set menu is priced at £50pp and is available from 29th October to 11th November. Trishna has five days of Diwali festivities planned, including feast menus, bespoke cocktails, and a candlelit dinner on Saturday 10th November. Make your way through the installation of lights and exotic flowers for a celebratory meal to remember. 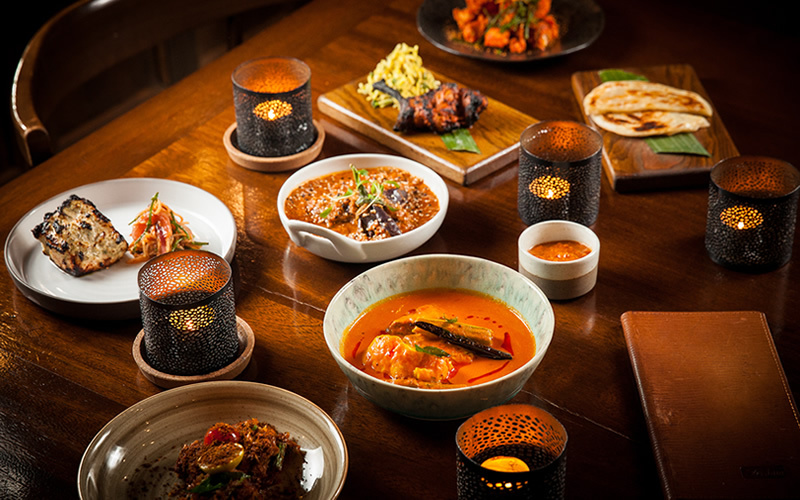 The six-course tasting menu includes popular dishes from Indian’s south-west coast, such as Koliwada squid and shrimp, Hariyali bream, and meen manga curry with hake, mango and tamarind. The Diwali tasting menus at Trishna are available from 5-9th November. 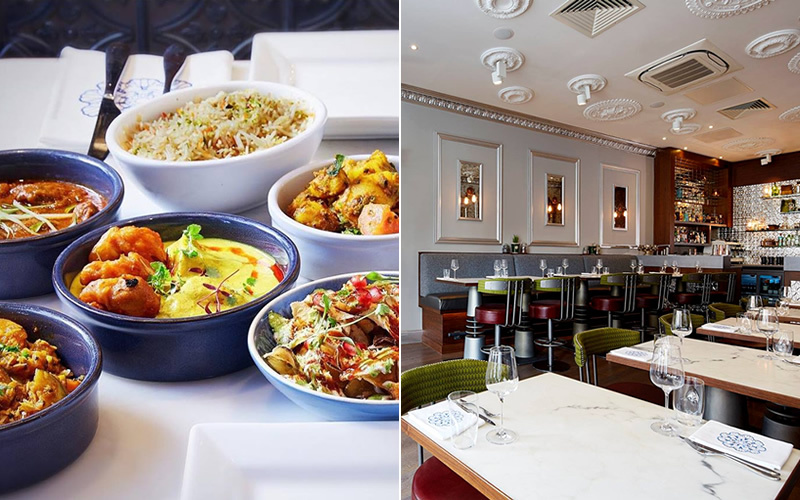 Situated on Old Brompton Road, Flora Indica specialises in modern Indian small plates and creative cocktails. For Diwali, they’re offering a four-course menu that includes a Flora Fizz cocktail on arrival. If you like the sound of slow-braised lamb rogan josh or monkfish and king prawn with Bengali malai curry sauce, book your table today. The Diwali menu is priced at £45 and is available from 5-11th November. Benares is celebrating the Festival of Lights with a display of brightly coloured flowers and candles surrounding a statue draped in silk scarves. These scarves will be gifted to ladies dining in the restaurant. At lunchtime, diners can enjoy a special thali which includes lamb rogan josh and tandoori sea bass for the meat eaters and kadai paneer and spiced baby aubergine for vegetarians. 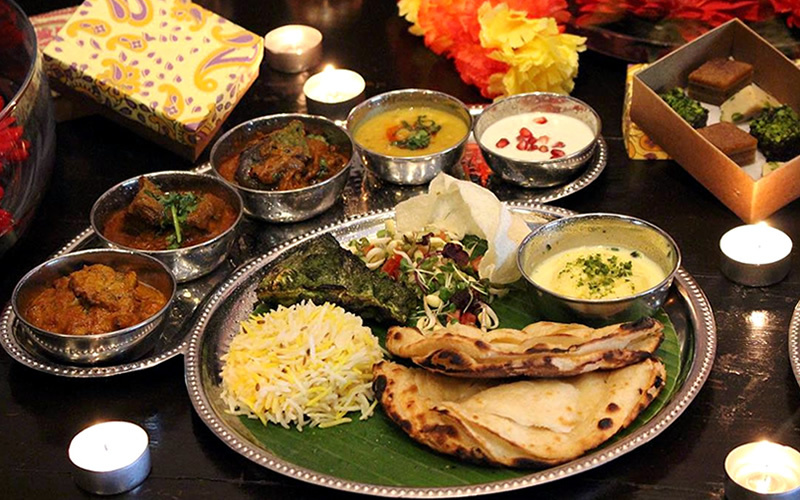 The Diwali thali is priced at £27 (veg) or £29 (non-veg) and is available from 29th October until 9th November. Bringing Indian fine dining from Rajasthan to south-west London, Chokhi Dhani offers a sophisticated setting for your Diwali celebrations. From 1-11th November, diners can enjoy traditional vegetarian dishes such as paneer kofta in a rich cashew nut sauce, tamarind pickled rice, and a sharing platter of vegetable fritters. 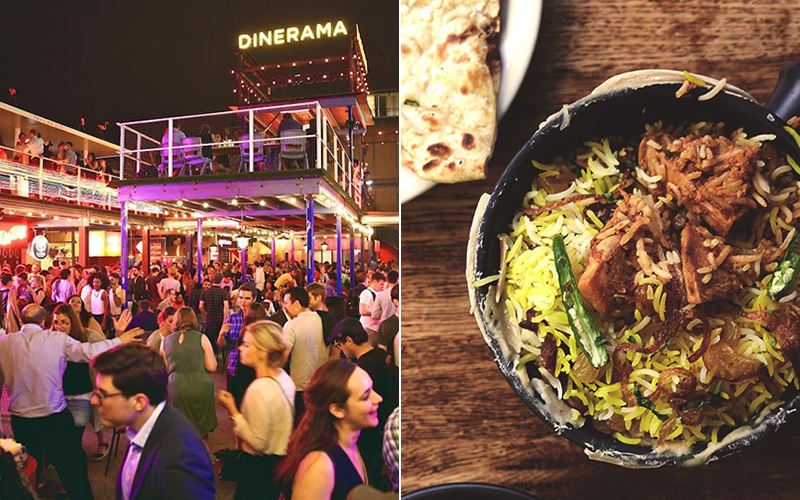 Dishoom have teamed up with Street Feast to host a special Diwali celebration at Dinerama, complete with street food and live music, spoken word, and poetry from British Asian artists. There will be vegetarian dishes from Club Mexicana, Fundi Pizza and more, plus a huge jackfruit biryani and pau bhaji provided by Dishoom. £1 from every ticket will be donated to Seeds of Peace, a charity helping teenagers from regions of conflict learn the skills of making peace. Tuesday 30th October, 6pm-10.30pm. Tickets, priced at £8, include entry, chai and mithai (Indian sweets). Like big name chefs, barbecues, and the best of British food? Then you’ll love these festivals happening around the UK this summer. 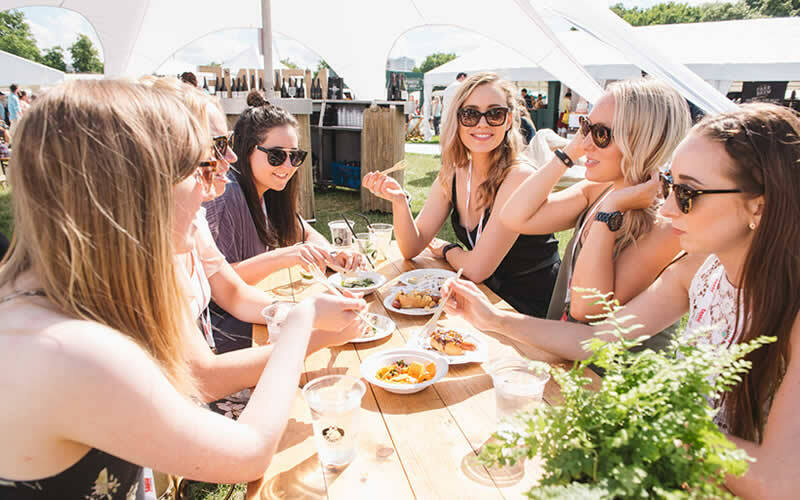 London’s biggest restaurant-slash-food festival makes a return to Regent’s Park. Already a real who’s-who of London’s restaurant arena, guest appearances from Magnus Nilsson – behind the remote and much pilgrimaged Faviken, Sean Gray ­– who heads up the kitchen at the revolutionary Momofuku Ko, and Niklas Ekstedt ­– the bloke who helped make live fire cooking cool again, will show London, as great as it is, still has some tasty things to learn. Expect a knock-out restaurant line-up too – this year’s attendees include Bombay Bustle, Freak Scene, and Duddell’s.